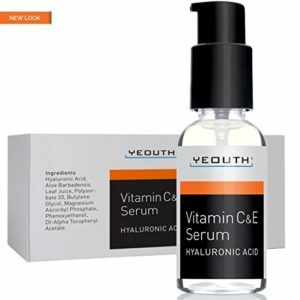 If you love the YEOUTH Hyaluronic Acid, you will love their 20% vitamin C serum even more. The main aim of the YEOUTH Vitamin C Serum is to plump up your skin and to protect your skin from the ravages of free radical damage and it does this very well. This vitamin C serum is one of the consistently good sellers on the market, in fact, all of the YEOUTH anti-aging products sell well. All you need to do is to apply a few drops of this serum to your skin while it is still damp from cleansing and massage it into your face and neck area. It will absorb quickly and then you can follow up with your YEOUTH Hyaluronic Acid and YEOUTH Neck Firming Cream, and other skincare products for beautiful, flawless skin. Stimulates collagen and plumps skin. 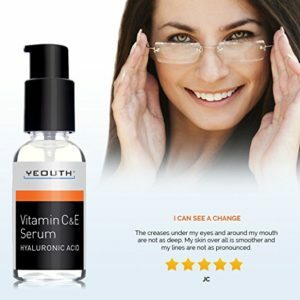 What does the YEOUTH Vitamin C Serum do? This vitamin C serum was designed to plump up your skin by filling in the fine lines and wrinkles, as well as evening out your skin tone, reducing the size of your pores and smoothing out the texture of your skin. It also helps to minimize age spots and hyper-pigmentation, due to too much exposure to the sun and leaves your face feeling wonderfully hydrated, smooth and fresh. The YEOUTH Vitamin C Serum is perfect for anyone who wants to slow the aging process of their skin. If you have noticed a few fine lines on your face, a few age spots or roughness due to too much exposure to the sun, then the powerful antioxidants in this serum will help to smooth and brighten your skin significantly. It will also protect your skin from free radical damage, but you should always wear a sunscreen to protect your skin when outside. When you start using thsi vitamin C serum you will start to notice a big difference in the look and feel of your skin in a matter of days (I did!). What are the ingredients in this serum? 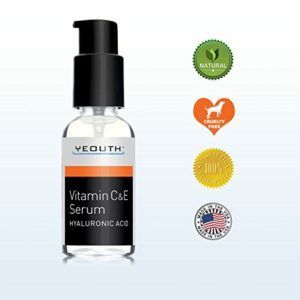 This vitamin C serum by YEOUTH was made in an FDA registered facility in the USA. It is cruelty free and contains natural ingredients. The key ingredients include vitamin C, vitamin E and hyaluronic acid. Ingredients: Purified Water, Aloe Barbadensis Leaf Juice, Magnesium Ascorbyl Phosphate, Sodium Hyaluronate, Butylene Glycol, Polysorbate 20, Tocopherol, Phenoxyethanol. Vitamin C is a powerful antioxidant that rejuvenates your skin and neutralizes the free radicals produced by UV light that damage your skin. This vitamin is also essential for cellular renewal and is a vital component in stimulating the production of collagen. With a vitamin C serum, your skin looks brighter, any sun spots or age spots are reduced and your skin looks plumper, fresher and healthier than ever before. Vitamin E is am age old remedy for dry skin, because it forms a protective barrier against the loss of moisture. It is also needed for healthy cellular activity and since it is also a strong antioxidant, it works alongside vitamin C to reverse the signs of too much sun exposure and free radicals. Hyaluronic acid is a super hydrator, increasing the amount of moisture in your skin. It is essential for dry, tired looking skin and you will notice a significant difference in the smoothness and texture of your skin when you include hyaluronic acid in your beauty routine. Just like vitamin C and vitamin E, hyaluronic acid helps to plump up your skin by stimulating the growth of collagen. And if your skin is really very dry and rough, it is best to also include a hyaluronic acid serum each day, as well as your vitamin C serum. 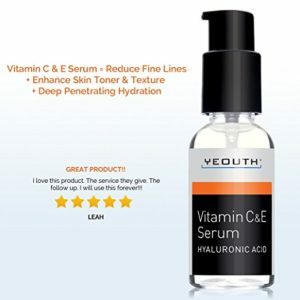 What do customers think about the YEOUTH Vitamin C Serum? A few customers have not had the results they expected with this serum, but the vast majority of reviews from online customers say that they absolutely love this vitamin C serum. They find that they see good results in just a few weeks, they love the way their skin feels after using this vitamin C serum, that that their skin feels and looks more hydrated and smoother. I am very happy with this product as I was able to see the results within 2 weeks in terms of hydration and a little brighter looking skin. I ordered this a week ago and the redness has leveled out within days! Also – my oil on my forehead and nose region have disappeared! I’m loving this! My skin is so much smoother and even!! I have those little bags starting under my eyes and this stuff has helped tremendously. My skin is soft and supple. I am very happy thus far with this serum. No question that my forehead is much smoother than it was a month ago. The range of YEOUTH serums are very popular and most customers tend to use more than one of these serums at the same time. 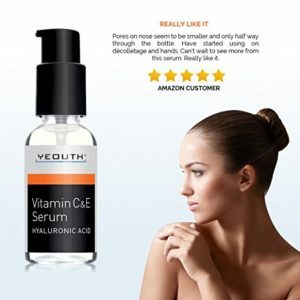 The YEOUTH Vitamin C Serum is perfect for anyone who wants to prevent their skin showing signs of aging due to free radical damage and for anyone who has already noticed these changes. This serum helps to reduce fine lines and wrinkles, minimize age spots and sun spots and plump up your skin, making you feel younger and your skin smoother and more even in texture and pigmentation. It is definitely worthwhile adding thsi serum to your daily beauty routine. Find the best Hyaluronic Acid Serum for your beauty routine, here.